Trying to move your Turtle into a new routine too soon can cause a setback, so wait until Turtle is truly feeling confident before making the change to underpants. 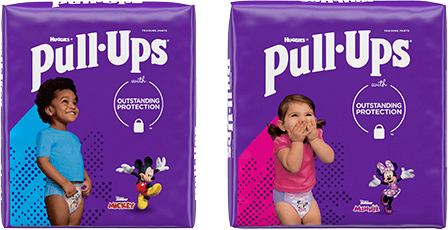 Remember that she’s now used to the Pull-Ups® in the same way she used to be attached to her beloved diapers. So use a slow, similar process to ease your little Turtle into the idea of undies. Present underpants as the “pull up, pull down” step she’s already used to; the only thing that has changed is what she’s wearing. Show your Turtle a photo of herself as a baby in diapers. “Look how tiny you were when you were a baby. You still were in diapers. Now you are a bigger girl in Pull-Ups. Next, you’ll be in Big Girl undies, just like Cousin Lily. Maybe one day soon you will want to pick out some undies when we go shopping.” Have her help shop for them if she’s interested, but don’t be surprised if it’s too overwhelming for her. Nonchalantly bring home some cute undies, and let her check them out when she’s ready. Keep the new undies in the bathroom with her Pull-Ups. Remember that you want to keep the routine as close to identical as possible, so that your child is comfortable. After a few weeks, ask your child if she’s ready to try them. Sometimes, Turtles find it helpful to put their new underwear on over their Pull-Ups as they transition to Big Kid underwear. Offer occasional suggestions to your Turtle about using undies, but allow your Turtle to wear Pull-Ups as long as she likes. Pushing a Turtle to progress faster than she is ready can cause resistance. Deep down, she really does want to get the hang of this potty training thing; she’s just very cautious about it. She will decide she’s ready to move on when it’s the right time for her.